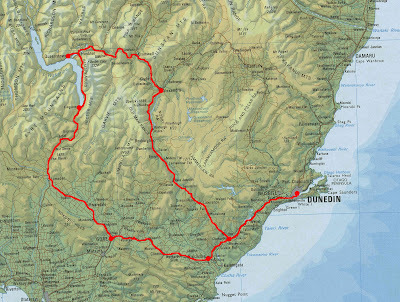 This loop ride around the centre of the Otago Province of the South Island offers lots of variety. It is a fairly gentle 524km ride which offers plenty of places to explore and a some fantastic scenery. We split the trip into 7 days, but you will want to spend a few days in Queenstown at least. Queenstown is New Zealand's number one visitor destination and it has lots to offer everyone. We used B'n'B, camping ground cabins and motels for accommodation on this trip. All of the places we visited are good places to explore and enjoy.